Nyhavns FÃ¦rgekro is located in New Hafen, in the heart of Copenhagen. 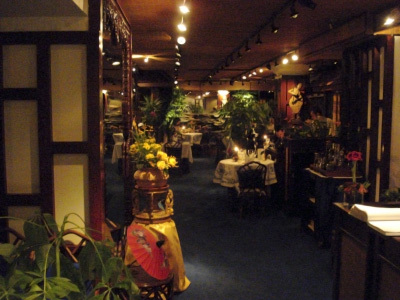 The restaurant has a traditional decor and is relatively comfortable. I highly recommend the very nice terrace, a good place for “flirt and skirts”. Service was good but very slow. As the restaurant was packed, they could have done with a bit more staff. As main course, I had the frokoststeak. 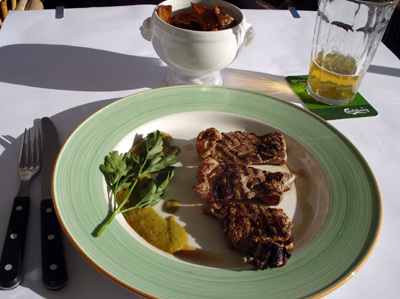 The steak was served with a very good mustard sauce and on the side a kind of wedges. The meat was tender and tasty. One regret, the wedges were a bit too oily. As desert, I had the apple pie. 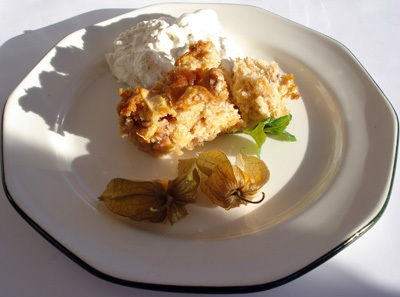 The apple pie was served with vanilla flavored whipped cream, mint leafs and tropical fruits. The pie, with it very soft biscuit was very good. Around $55, including drinks (beer and coffee) and tip. 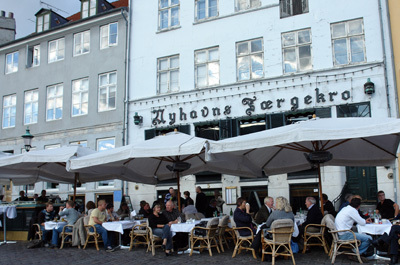 Considering the location, the current strength of the Danish krone and food quality, Nyhavns FÃ¦rgekro is a very good value for money. I will come back. Blue Elephant is located in Radisson SAS Scandinavia Hotel near the center of Copenhagen. 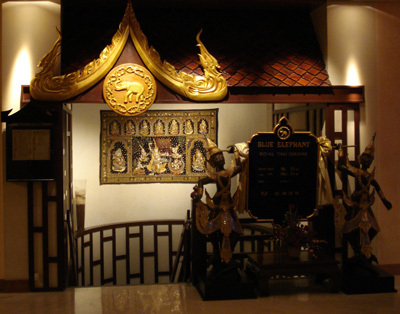 The restaurant is very comfortable and has a beautiful Thai themed decor. The service was very mechanical and the burned menu didn’t add to the experience. On the upside, an orchid is offered to womens when leaving the restaurant. 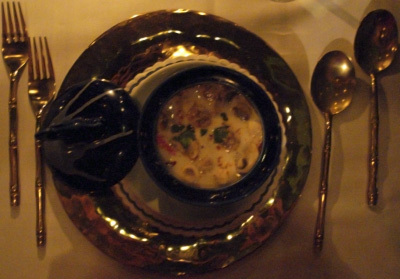 I started with a very traditional tom kha gai, a chicken and lemon grass soup. The soup was very flavorful but could have been a bit more spicy. 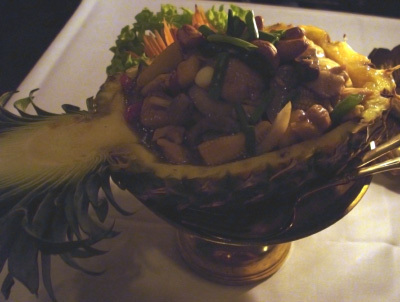 As main course, I had kai himmapan, a dish of chicken with cashew, green peppers, red peppers, baby corn, pineapple and onion served in an half pineapple. It was good but, again, a bit bland for Indian food. Around $80, including drinks (mai tai, still water and espresso) and tip. Considering the food, the location and the current strength of the Danish Kroner, Blue Elephant offers just a fair value for money. I probably won’t come back. 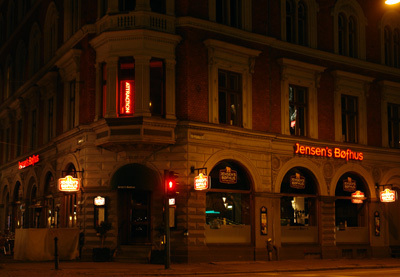 Jensen’s BÃ¸fhus is a casual restaurant located in the center of MalmÃ¶. The restaurant is relatively comfortable and has a simple pub decor. The service was good but a bit slow. Our waitress made genuine efforts to please us. 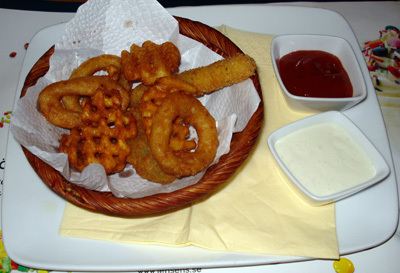 As starter, I had the snack basket that comprise onion rings, mozzarella sticks, potato waffles and cheese and jalapeÃ±o nuggets served with spicy tomato sauce and white sauce. While a bit heavy (all deep fried), everything was good. As main course, I had the favorite steak. The steak, tender and juice was excellent. 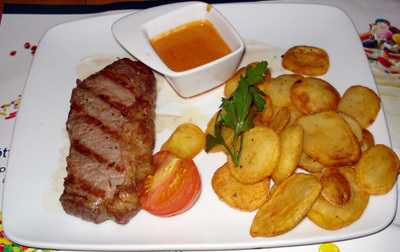 It was served with a tomato, potatoes and a paprika sauce that was both a surprising and perfect complement to the steak. 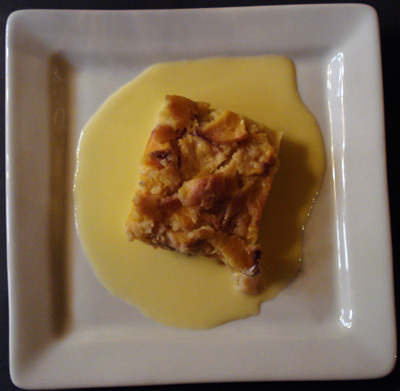 As desert, I had the queen’s delight. 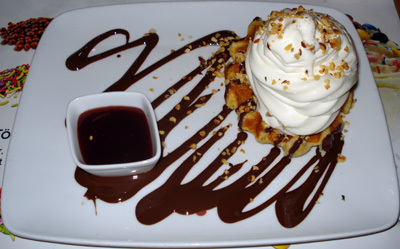 The queen’s delight is a soft vanilla ice cream topping a waffle and served with chocolate sauce, nuts and strawberry jam. The ice cream was very good but the waffle was a bit too sweet to my taste. The jam, overly sweet, was unnecessary. Around $50, including drinks (pear cider) and tip. Considering the food, the location and the current strength of the Swedish Kronor, Jensen’s BÃ¸fhus offers good value for money. I’ll come back. Thai Edge is located in Brindleyplace, in the heart of Birmingham. The decor is very nice, both modern and Thai. The restaurant is very comfortable. The music was a bit loud and repetitive. While the tiles on the floor are practical, they make the place feel a bit cold. The service was very good. Our waitress made genuine efforts to please us. All the staff wears very nice Thai uniforms. I shared a “Royal Orchid” menu as it offered a wide diversity of dishes. As starter, the menu offered chicken satay, golden bags, spring rolls, prawn rolls and chicken in pandanus leaves. The golden bags are a kind of fried shrimp dumpling. Everything was good but the chicken satay and the chicken in pandanus leaves were above the rest offering more subtle flavors. As main course, the menu offered chicken green curry, stir-fried beef with chili and basil, pork with garlic and pepper, stir-fried mixed vegetables and egg fried rice. The egg fried rice was more Chinese than Thai but again everything was good. The stir-fried beef with chili and basil was above the rest being hot and very flavorful. The chicken green curry was very good too. Around $70, including drinks (still water, beer and espresso) and tip. Considering the food, the location and the current strength of the British pound, Thai Edge offers very good value for money. I’ll come back. 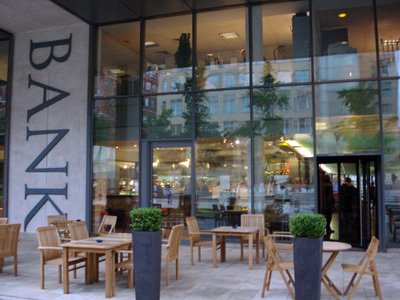 Bank is located in Brindleyplace, in the heart of Birmingham. The decor is very modern and the restaurant is very comfortable. You should note that they have nice terraces overlooking the canal at the back of the restaurant. The service was very good. Our waitress made genuine efforts to please us. As starter, I had the smoked haddock and leek risotto. 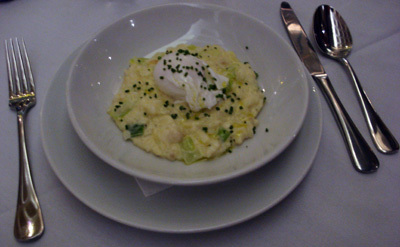 The risotto was served with a poached egg and mustard dressing. It was both original and very good. The texture of the risotto was perfect. As main course, I had the rump of lamb. 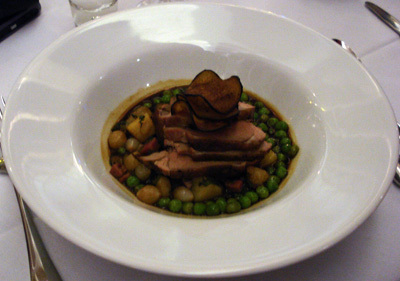 The lamb was served with peas, potatoes, spring onions and bacon. The lamb, perfectly cooked was very tasty. It was well complemented by the vegetables. Very classic but very good. Around $80, including drinks (still water, wine and espresso) and tip. Considering the food, the location and the current strength of the British pound, Bank offers good value for money. I’ll come back. 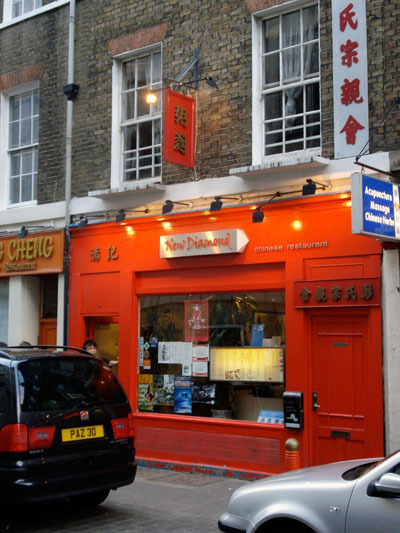 New Diamond is located in Chinatown, right in the center of London. The restaurant is relatively comfortable. The decor is very basic without any real effort. As negative, table cloths are not changed between customers. I shared a “menu B” as it offered a wide diversity of dishes. As starter, “menu B” offered prawn toasts, hot and sour soup and crispy aromatic duck. The prawn toasts were served with crispy seaweed and BBQ ribs. The crispy aromatic duck was served with pancakes, cucumbers sticks and spring onions. The prawn toasts were a bit dry but the seaweed was excellent. While the hot and sour soup tasted good, the texture was very artificial. The crispy aromatic duck was excellent. As main course, “menu B” offered special rice, oyster sauce vegetables, chicken with cashew nuts, sweet and sour pork and spicy beef. Everything was good but sweet and sour pork and the spicy beef were above the rest. Servings are generous, so it’s a lot of food. Around $50, including drinks (beer) and tip. Considering the food, the location and the current strength of the British pound, New Diamond offers a good value for money. I’ll probably come back. 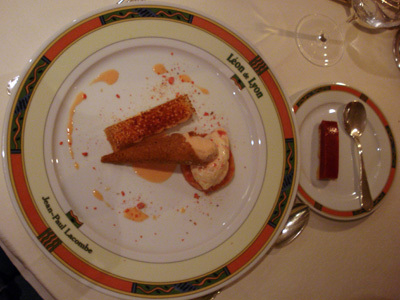 L’Est is one of Paul Bocuse bistros located as its name in French indicates in the east of Lyon. The restaurant is set in the old Brotteaux train station and has a train themed decor. While the restaurant is relatively confortable, tables are very close to each other and you don’t get much space. As you could expect, the restaurant was packed on a Friday night. We had to wait and after 20 minutes ended up with a table hidden behind a door. When we were seated, the service was good but relatively slow. The certainly could do with more staff. As a starter, I had pan fried foie gras. The foie gras, served with cooked apple and mango slices, polenta and a passion fruit sauce was delicious. The combination of foie gras and sweet fruits works extremely well. As main course, I had red snapper ala plancha. The snapper, grilled the Spanish way, was served with a mix of confit vegetables and a basil tomato sauce. The fish was perfectly cooked and well complemented by the vegetables. The sauce was very flavorful and it was easy to taste the basil. Around $40, including drinks (mineral water, communard, espresso) and tip. While the service wasn’t great, if you consider the quality of the food and the current strength of the euro, you’re getting very good value for money. I will certainly come back. 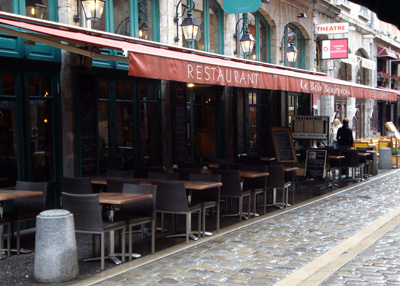 Leon de Lyon is located in a small street in the heart of Lyon. The restaurant is very comfortable with a classical decor. From the fine tablecloths to the crystal glasses, everything is perfect. 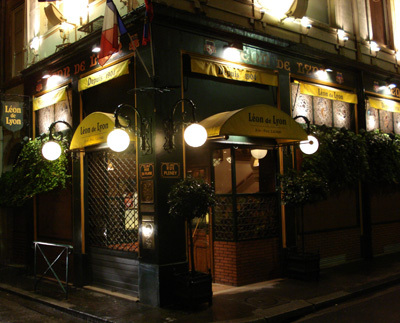 The chef, Jean-Paul Lacombe, is a celebrity in France and the restaurant, which originally opened in 1904, is an institution in Lyon. Leon de Lyon guests include countless celebrities and heads of state. Most notably, the place was chosen for the 1996 G7 summit heads of state private dinner. The service, very formal in the French tradition, was excellent. Our waiters provided good advice and detailed descriptions. The sommelier was as good. While our waiters did speak English, I was disappointed not be able to get a menu in English for my American friends. As main course, I had the pike quenelle. 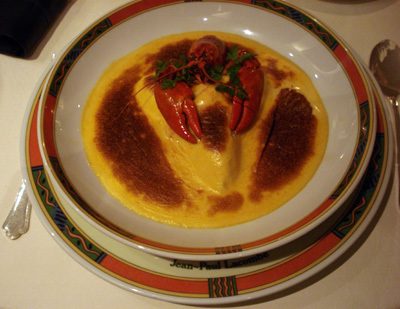 The quenelle was served with crayfish tails and Nantua sauce. The photo really doesn’t do justice to the dish as the presentation was truly exceptional. The taste was on par with the presentation. The quenelle was soft and fluffy, perfectly complemented by the crayfish tails and the Nantua sauce. Following the main course, I had cheese. As you would expect, the cheese platter is exceptional, offering a very large variety of all perfectly matured cheeses. 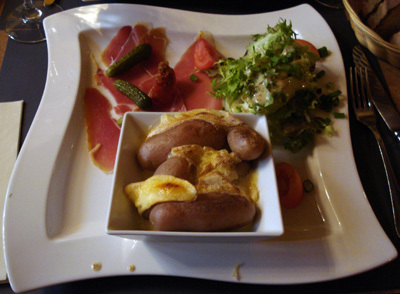 They cover all tastes, from a very mild cervelle de canut to a quite strong roquefort. 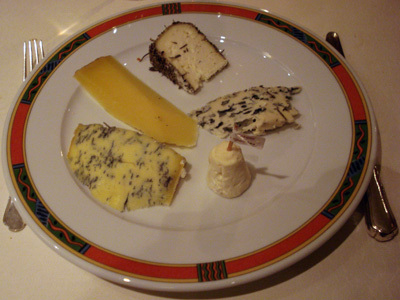 The cheeses were served arranged from the mildest to the strongest. As a desert, I had 5 small deserts with Saint-Genix praline, a local speciality. The Saint-Genix praline has a very distinctive red color. The deserts were praline nougat, praline ice cream, praline sorbet, praline cake and on a separate plate, praline tart. They were all delicious, with a particular mention to the praline tart which was from far the best I ever had with it’s nice very smooth texture.